UK: SSE has announced plans to drop two offshore projects with a combined capacity of more than 1GW and limit its involvement in around 11GW of Round 3 developments. 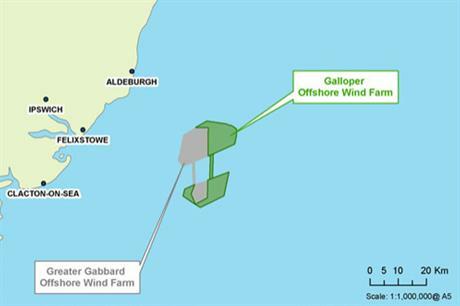 The UK utility said it was ending its interest in the 340MW Galloper wind farm off the southern English North Sea coast, which it has been developing with Spanish energy company Repsol. SSE said it will be working with "other stakeholders to secure the maximum possible value for the project". The other project is the 690MW Islay wind farm in Scotland. SSE said it would not be investing further in the project. Additionally, the company said it will limit its involvement in the consortiums for the 9GW Dogger Bank and the 3.5GW Forth of Firth zones. SSE said its involvement would not go beyond working with other consortium members to achieve construction consent. SSE's decision follows a review of its offshore commitments that was announced at the end of January. Thicame after two projects — the 1GW Beatrice and Galloper — failed to pass the UK government's preliminary affordability test. SSE said that Beatrice, in the Scottish North Sea, would continue to be developed. The company said it would continue to invest in the project in the hope it would be added to the UK government's affordability list. But it would review its position on Beatrice next year, the company added. Explaining the decision, SSE Reneables managing director Jim Smith said: ""In offshore wind farm development, there are two major, related hurdles that projects currently have to overcome. The first is the levy control framework, which has the reasonable objective of controlling costs to customers from government energy policies — but which also means there is limited support for offshore wind. "The second is cost — the future of offshore wind farm development depends on a sustainable and lower cost supply chain." Coincidentally, the announcement was made alongside another promising energy price freezes for consumers up until 2016. Earlier this year, SSE withdrew its plans to construct two wind farms in Scotland with a combined capacity of 117MW. The company said that the planned 81MW Dalnessie development in Sutherland and 36MW extension of the Fairburn project in Ross-shire are no longer deemed "financially viable".